Not generally one to back down from a challenge, I've been working on figuring out how to handle pastels on slightly "grittier" sanded paper. My first attempts were ragged and I gave up perhaps a bit too quickly. Part of it was probably related to my failure to use blending tools and ending up with very sore fingers! So this week I've revisited the coarser grit papers to try some different techniques, with a combination of finger blending, applying barrier cream to my hands and/or wearing gloves, and the use of tools such as blending stumps. Smoothly and thoroughly blending a background color seems to make an easier surface for painting (at least for me! 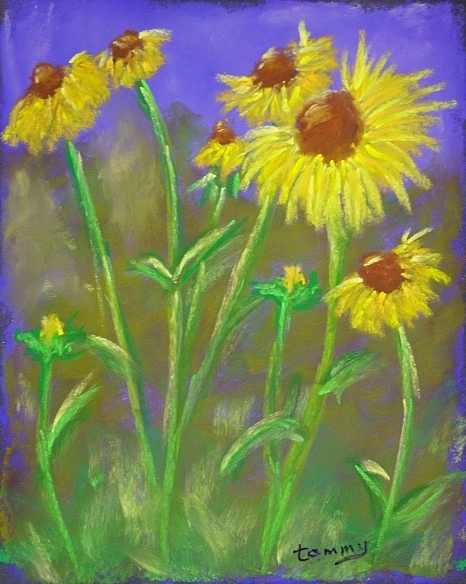 ), but the coarse grit still holds the pastels nicely, I've found. This method also seems to help me work a little bit more loosely with the top layers, which is something I've struggled with and I'm really trying to improve on that. 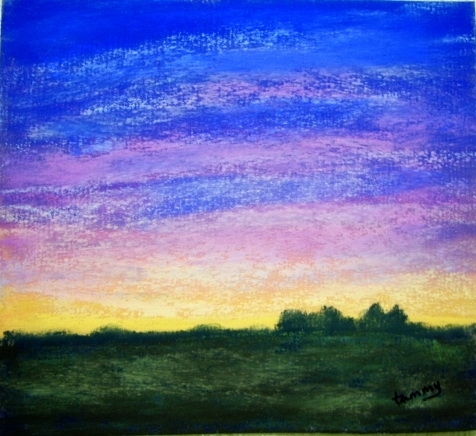 © 2013 Tammy Kaufman - Pioneers - soft pastels on 500 sandpaper 4.5" x 5.5"
I've been using a combination of semi-hard pastels for earlier layers and finer details, and soft pastels for the looser top layers. I'm finding that I like the textured appearance the rougher sandpaper provides to grasses, trees and even clouds when I apply the top layers of pastels very lightly. © 2013 Tammy Kaufman - Prime Time - soft pastels on Uart 240 sanded paper 6" x 6"
I also decided to try a couple of practice sessions using a monochromatic color palette on my sandpapers. 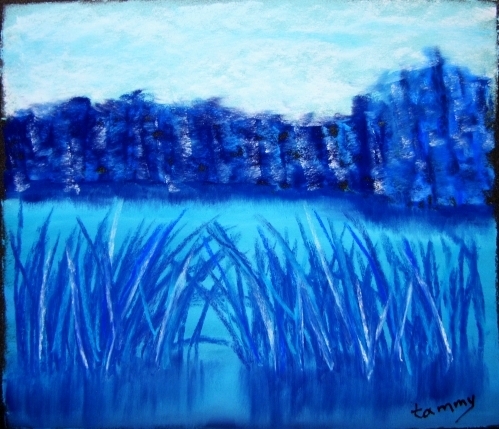 First, I used only blues, leaving the dark charcoal grey of the sandpaper as the background color. 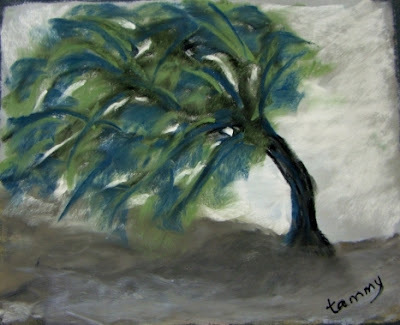 © 2013 Tammy Kaufman - Tangled Up In Blue - soft pastels on 500 sandpaper 4.5" x 5.5"
Next up was greys, again on the darker background. These pastels are all grey tones but interestingly I noticed just how strikingly different monochromatic colors can look depending on the shades placed next to them. © 2013 Tammy Kaufman - Selene's Joy - soft pastels on 1000 sandpaper 4.5" x 5.5"
I'm continuing to enjoy learning pastels and am finding that sanded surfaces are incredibly versatile, offering a very nice range of effects, and experimenting with them is a lot of fun - I feel like a kid in a candy store!